Pre-1972 – From late 1960s to 1971, comes the arrival of the musical era and the arrival of the golden of voice of Nora Aunor. Aside from stocking success in music, Nora ventured into films, with string of films that featured other singers like Eddie Peregrina, Edgar Mortiz, Manny de Leon, Victor Laurel and Victor Wood. Films that begin with singing and mostly ends with big production number, all with singing and dancing – ala-Bollywood. Venturing to film making, Nora found her rival, “dramatic-child-star” now a strugling “teen-film-star” in a “musical-era,” Vilma Santos. Although the competition was slightly in favor of Nora, she found herself in numerous occassion, having a strong resistant from Vilma. On 1971, there were atleast one Nora or Vilma film showing in local movie houses. Nora Aunor did seven films (Always in My Heart; Ang Waray at ang Talyada; Guy & Pip; Lollipops and Roses; My Blue Hawaii; My Prayer; The Singing Filipina) and Vilma Santos did nine (Angelica; Eternally; Ikaw Lamang; Love at First Sight; Our Love Affair; Teen-Age Senorita; The Sensations; Wonderful World of Music; Young Lovers), most of these films were musicals. The next year, comes the confirmation of their rivalry. Nora Aunor’s 1972 Films (8): (And God Smiled At Me; Dito Sa Aking Puso; Gift of Love; Kung May Gusot, May Lusot; My Little Brown Girl; Nora, Mahal Kita; Way Out In The Country; Winter Holiday) – Most of her films capitalized on her golden voices and untapped dramatic talents. Vilma Santos’ 1972 Films (14): (Aloha, My Love; Ang Kundoktora; Dalagang Nayon; Dama De Noche; Don’t Ever say Goodbye; Dulce Corazon; Hatinggabi Na, Vilma; Inspiration; Leron, Leron, Sinta; Little Darling; Remembrance; Sweet, Sweet, Love; Takbo, Vilma, Dali; Tatlong Mukha ni Rosa Vilma) – Most of her films were not focused on singing but more on her versatility. 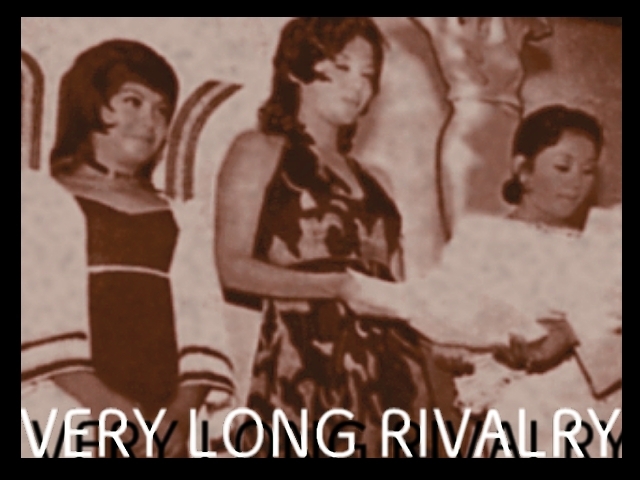 This entry was posted in ARTICLES, VIDEOS and tagged A Very Long Rivalry - 1972, ARTICLES, Nora Aunor. Bookmark the permalink.